Hello friends, I hope you all are doing great. 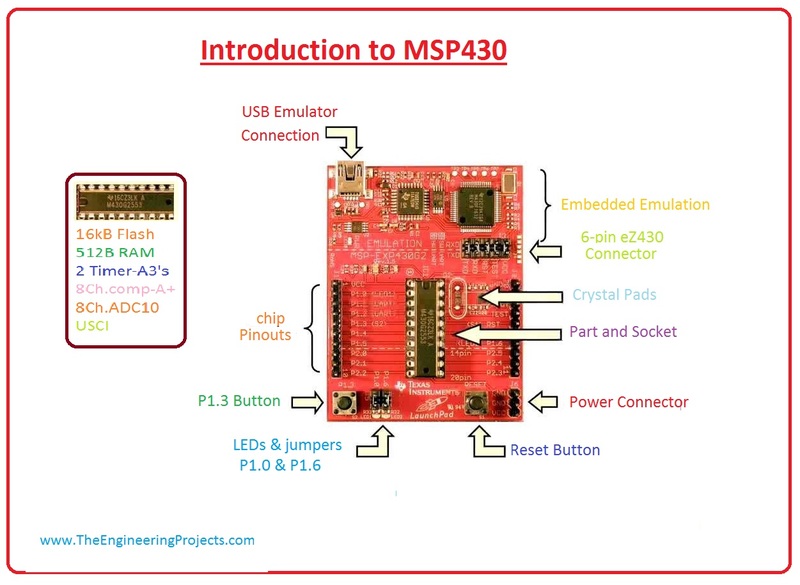 In today’s tutorial, we are gonna have a look at detailed Introduction to MSP430. MSP430 is a microcontroller portfolio which offers different varieties of sixteen-bit Microcontrollers. These microcontrollers integrated with ultra-low power and digital and analog peripherals devices for sensing and measurement applications. MSP430 microcontrollers with non-volatile FRAM (ferroelectric random access memory) provides the lowest stand by power (350nA with RTC), 100 µA/MHz active power and have the capability to recover system state after sudden the power failures. MSP430 used in different applications such as sensor systems which received analog signals and converts them into digital values and after processing send these values to host systems. In today’s post, we will have a look at its introduction, working, protocol, features, applications, etc. I will also share some links where I have interfaced it with other microcontrollers. If you have any questions please ask in comments I will resolve your problems. So, let’s get started with a basic Introduction to MSP430. MSP430 is a microcontroller portfolio which offers different varieties of sixteen-bit Microcontrollers. These microcontrollers integrated with ultra-low power and digital and analog peripherals devices for sensing and measurement applications. This module consists of five low power modes which increase battery life in portable measurement applications. MSP430 has a feature of 16-bit registers, sixteen-bit RISC Cpu and constant generators which provides maximum code efficiency. The digitally controlled oscillator (DCO) of this module converts low power modes to active mode in less than 6µs. The MSP430x11x series is an ultra-low power signal microcontrollers which consist of the sixteen-bit timer and fourteen input and output pinouts. MSP microcontrollers give ideas and enable designers to produce such high-performance applications, which supports the industry’s lowest stand by power, analog and digital devices suitable for sensing and measurements applications, and also support 20+ wired and wireless connectivity applications. Main applications which it provides are sensor system which received analog signals and converts them into digital values, and after processing this data sends to host modules. Its another area of applications is RF front end sensor. Now, we discuss its pinouts. 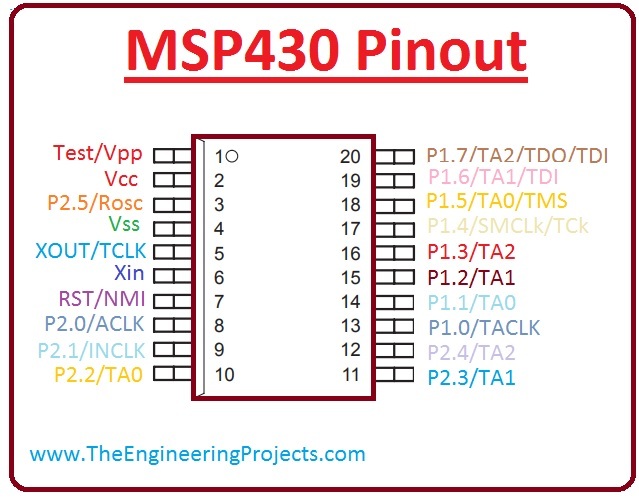 These are the main pinouts of MSP430 which are described below. Pin#13 P1.0/TACLK It is general-purpose digital I/O pin / Timer_A, clock signal TACLK input. Pin#14 P1.1/TA0 It is general-purpose digital I/O pin/Timer_A, Capture: CCI0A input, Compare: Out0 output. Pin#15 P1.2/TA1 It is general-purpose digital I/O pin/Timer_A, Capture: CCI1A input, Compare: Out1 output. Pin#16 P1.3/TA2 It is general-purpose digital I/O pin/Timer_A, Capture: CCI2A input, Compare: Out2 output. Pin#17 P1.4/SMCLK/TCK It is general-purpose digital I/O pin/SMCLK signal output/Test clock, an input terminal for device programming and test. Pin#19 P1.6/TA1/TDI It is general-purpose digital I/O pin/Timer_A, Compare: Out1 output/test data input terminal. Pin#8 P2.0/ACLK It is general-purpose digital I/O pin/ACLK output. Pin#9 P2.1/INCLK It is general-purpose digital I/O pin/Timer_A, a clock signal at INCLK. Pin#10 P2.2/TA0 It is general-purpose digital I/O pin/Timer_A, Capture: CCI0B input, Compare: Out0 output. Pin#11 P2.3/TA1 It is general-purpose digital I/O pin/Timer_A, Capture: CCI1B input, Compare: Out1 output. Pin#12 P2.4/TA2 It is general-purpose digital I/O pin/Timer_A, Compare Out2 output. Pin#3 P2.5/ROSC It is general-purpose digital I/O pin/Input for an external resistor that defines the DCO nominal frequency. Pin#7 RST/NMI It is Reset or nonmaskable interrupt input. Pin#1 TEST/VPP It is selected test mode for JTAG pins on Port1/programming voltage input during EPROM programming. Pin#2 VCC It is a Supply voltage. Pin#4 VSS It is Ground reference. Pin#6 XIN It is an Input terminal of the crystal oscillator. Pin#5 XOUT/TCLK The output terminal of a crystal oscillator or test clock input. Now, we discuss the features of MCP430. These are the main features of MCP430, Lets’s discuss them with detailed. It is available in a 20 pin plastic small outline widebody package. Its operating voltage range is 2.5v to 5.5 v.
Its active mode is 330 µA at 1 MHz, 3 V.
Its stands by mode are 1.5 µA. It’s off mode (Ram Retention) is 0.1 µA. This module is available in 16-bit architecture, 200ns instruction cycle time. This module consists of various internal resistors, single external resistor,32 kHz crystal, high frequency, resonator and external clock source. It has a 16-bit timer with a three capture/compare registers. In this module, programme protection is done by a security fuse. It has serial onboard programming. In the next coming lines, we will discuss MSP430 interfacing with RFID, first of all, we discuss components required for this circuit. In this circuit diagram, we are going to use UART hardware of MSP430, So you should put RXD and TXD jumpers on HM UART mode. After this connect the Tx of EM-18 to RXD (P1.1) of MSP430. In this project, we are going to use serial communication of data transfer. RFID also has another mode than serial mode but we are using RS232 communication mode. The RS232 pin of RFID the module connects with RXD pin of MSP430. To connect the RFID reader with MSP430 we have to enable the serial communication in MSP430. We can initialize serial protocol in MSP430 by using a simple command Serial.begin(9600), where 9600 is the baud rate. Now in order to read the incoming Serial data, we need to use value=Serial.read(). We can see in the given diagram that for communication by RFID use BAUD rate of 9600 bits per seconds. For MSP430 to create baud rate equal to the RFID baud rate to start communication, we use the command of “Serial.begin(9600);”. 9600 is a baud rate which can change. After setting of baud rate, MSP430 is ready to receive data. This data can be received by command “data = Serial.read();”. By this way, serial data is taken in ‘data ‘ named Integer. When we take a card near the reader, the reader reads data and forward it to MSP430, MSP430 after getting data show on LCD. So we will have an ID of a card on LCD. These are some applications of MSP430. It is used in Building & Home Automation Applications. It is used in Grid Infrastructure & Metering Applications. It is used in Portable Test & Measurement Equipment. It also used in Consumer Electronics. So, friends, that’s was all about MSP430 If you have any question about it please ask I comments I will resolve your problems. Take care until next post.